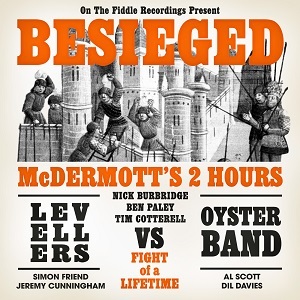 On this first new band album since Goodbye To The Madhouse in 2007, Nick Burbridge is joined by Simon Friend and Jeremy Cunningham from The Levellers, Dil Davies and Al Scott from Oysterband, along with usual suspects Ben Paley, Tim Cotterell and friends, to produce a relentless and inimitable album of folk/rock/punk music which places McDermott’s Two Hours immovably at the heart of all that has happened in this genre, while still full of biting contemporary references and adding strains of lyricism and tenderness not usually discovered there. Produced by Al Scott, Tim Cotterell and Jeremy Cunningham, and released by OTF Recordings, it represents the zenith of the band’s long, intermittent history. The album will be available from www.levellers.co.uk and through mainstream distribution. All pre-orders will receive an initial pressing which includes a bonus ‘Best Of’ album, Anticlockwise - previously unreleased on CD.